A Vindication of the Rights of Woman is a 1791 book of feminist philosophy by Mary Wollstonecraft. In it, Wollstonecraft responds to the educational and political theorists of the eighteenth century who wanted to deny women an education. She argues that women ought to have an education commensurate with their position in society, claiming that women are essential to the nation because they educate its children and because they could be "companions" to their husbands, rather than mere wives. Instead of viewing women as ornaments to society or property to be traded in marriage, Wollstonecraft maintains that they are human beings deserving of the same fundamental rights as men. Wollstonecraft was prompted to write the Rights of Woman by Charles Maurice de Talleyrand-Périgord's 1791 report to the French National Assembly which stated that women should only receive a domestic education; she used her commentary on this specific event to launch a broad attack against sexual double standards and to indict men for encouraging women to indulge in excessive emotion. Wollstonecraft wrote the Rights of Woman hurriedly in order to respond directly to ongoing events; she intended to write a more thoughtful second volume, but she died before completing it. 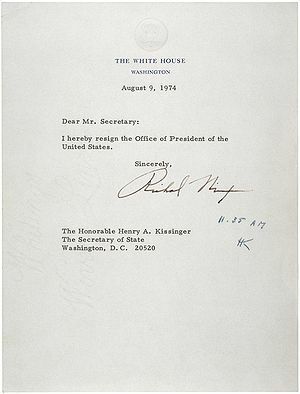 The resignation letter of U. S. President Richard M. Nixon on August 9, 1974 during the Watergate scandal. John Sidney McCain III (born 1936) is the senior United States Senator from Arizona. He was the Republican nominee for president in the 2008 United States election. During the Vietnam War, he nearly lost his life in the 1967 USS Forrestal fire. In October 1967, while on a bombing mission over Hanoi, he was shot down, seriously injured, and captured by the North Vietnamese. He was a prisoner of war until 1973. McCain experienced episodes of torture, and refused an out-of-sequence early repatriation offer. His war wounds left him with lifelong physical limitations. While generally adhering to conservative principles, McCain at times has had a media reputation as a "maverick" for his willingness to disagree with his party on certain issues. He secured the Republican nomination in 2008 after coming back from early reversals, but lost to Democratic candidate Barack Obama in the general election. ...that political opportunity theory explains the rise and decline of social movements by their dependence on outside, political factors? ...that impeachment in Norway was used six times in 1814–1845, but only twice since? ...that The Mass Psychology of Fascism, a book written by Wilhelm Reich in 1933, blamed sexual repression for the rise of fascism? ...that Roman embassies to China are reported in Chinese historical accounts from as early as 166? April 1, 1979 – Iran's government becomes an Islamic Republic by a 98% vote, overthrowing the Shah officially. April 9, 1948 – the period known as La Violencia begins with the assassination of Colombian Liberal Party leader Jorge Eliécer Gaitán. For the next ten years Liberals, Communists and Conservatives would fight each other in the conflict. April 9, 2003 – Government of Saddam Hussein overthrown by American forces in Iraq. April 19, 2006 – Han Myung-sook becomes South Korea's first female Prime Minister. April 24, 2005 – Presidential elections in Togo return Faure Gnassingbe to power two months after he was installed by the military following the death of his father, Gnassingbé Eyadéma. April 28, 1937 – Saddam Hussein, the President of Iraq is born. April 30, 1945 – Adolf Hitler and his wife of one day, Eva Braun, commit suicide as the Red Army approaches the Führerbunker in Berlin. Karl Dönitz succeeds Hitler as President of Germany; Joseph Goebbels succeeds Hitler as Chancellor of Germany. This page was last edited on 14 November 2018, at 17:14 (UTC).